SPA 101 ~ Pasaportes y… ¡ *FIESTA* ! First: Research the six cultural topics from the list in the document for your own Segunda vida country. 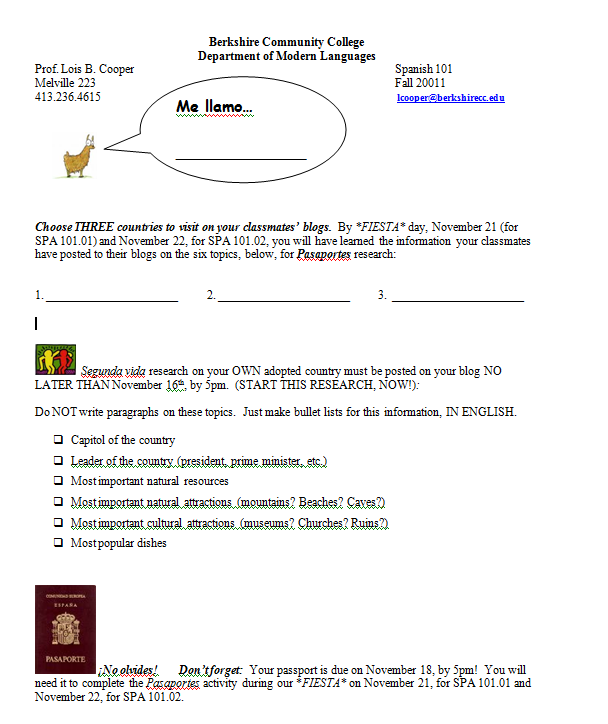 Second: Post this research in ENGLISH on your blog by November 16th, 5pm. Third: Choose three countries from among those your classmates have chosen for their Segunda vida projects. Fourth: Start learning the information they researched and posted on their blogs. Have that information learned by November 21 (SPA 101.01) or November 22 (SPA 101.02). We’ll have our Pasaportes activity on those days, in class. Fifth: Create a passport for your own country. Ask Profe to show you samples from previous years. This entry was posted in Cool Cultural Information, SPA 101 ~ Fall 2011 by Lois B. Cooper. Bookmark the permalink.